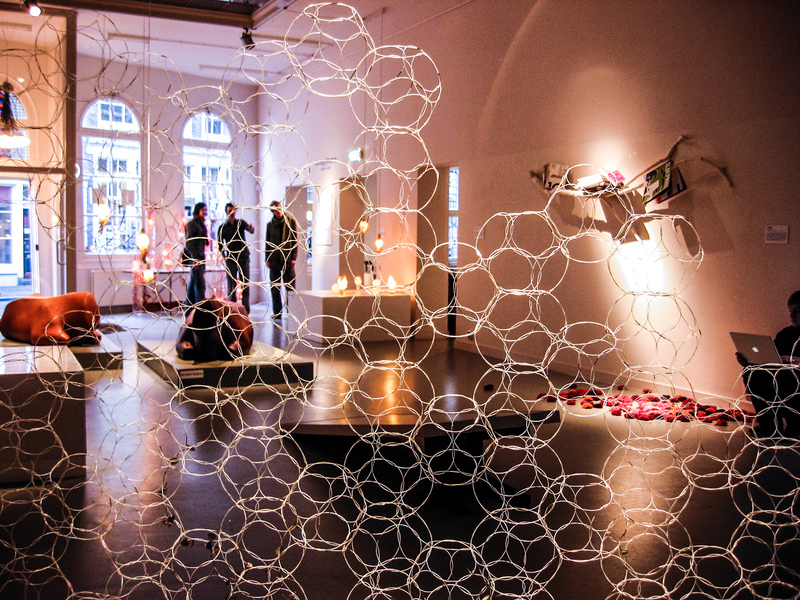 We were invited to present our work at New British Designers in Amsterdam, the exhibition showcased the work of designers of all different nationalities who had completed their studies at the Royal College of Art within the last three years. 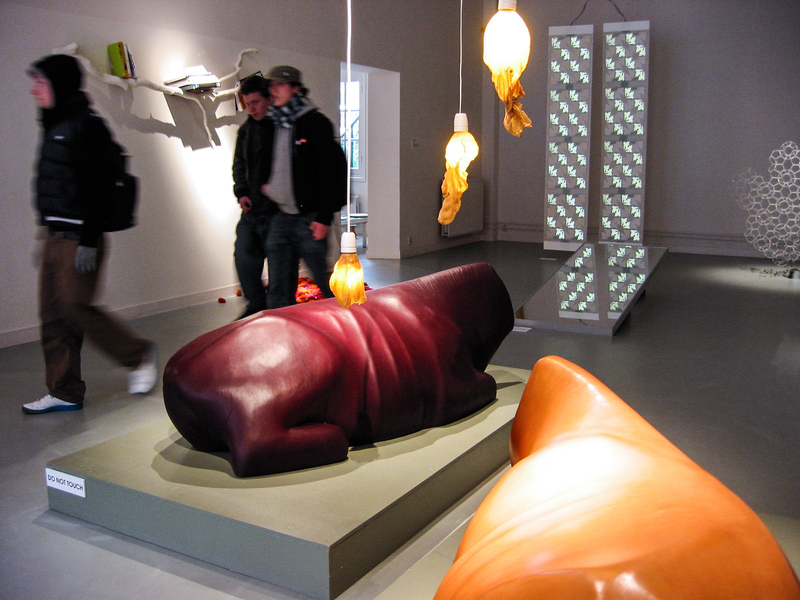 The exhibition was about transformation: turning banal materials, processes and objects into an unexpected design with its own story. 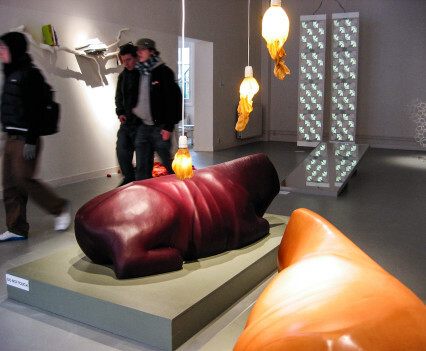 The designers selected for the exhibition were linked by their concern and interest in transformation: turning banal materials, processes and objects into an unexpected design with its own story. 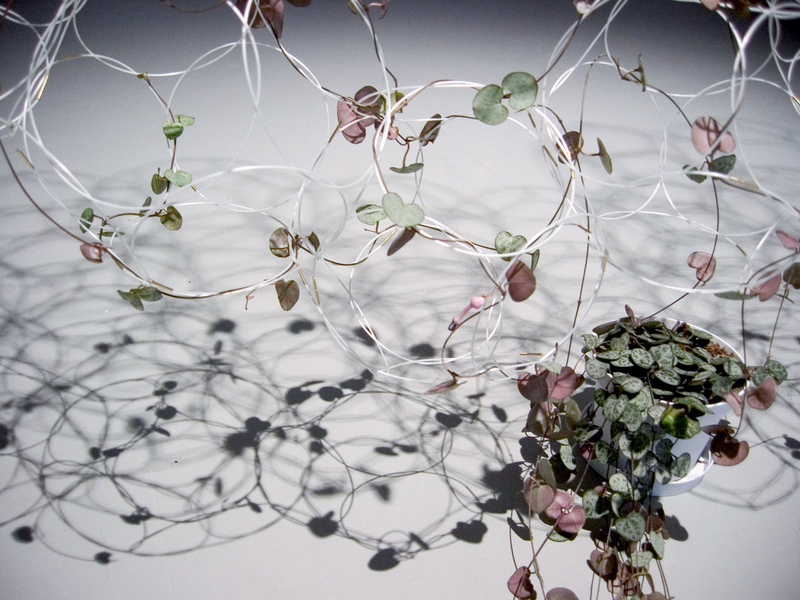 We showcased three pieces: Weather Patterns, Blumen and BioWall. 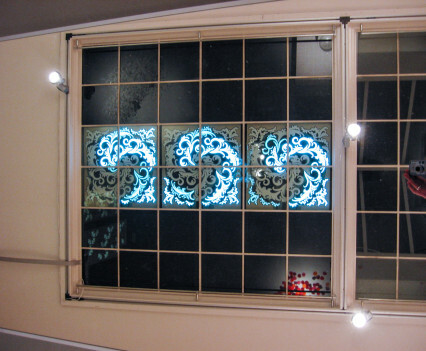 Weather Patterns was developed as a permanent light installation for York Art Gallery, UK. It is an architectural intervention combining traditional surface decoration with modern display technologies, allowing the building to communicate the changing weather cycles on site. For the exhibition at Droog Design we have integrated Weather Patterns into the existing architecture of the gallery and are displaying online weather data from the city of Amsterdam. Weather Patterns is part of an ongoing exploration dealing with the effects humans have on the environment. Scientific and technological progress has given us powerful tools to expand our knowledge, but it has also allowed us to work on a scale far beyond human. The whole world has become a laboratory and it becomes increasingly difficult to judge whether our experiments are well-designed or not. Within this area of research, global climate change is one of the most prominent and widely understood. 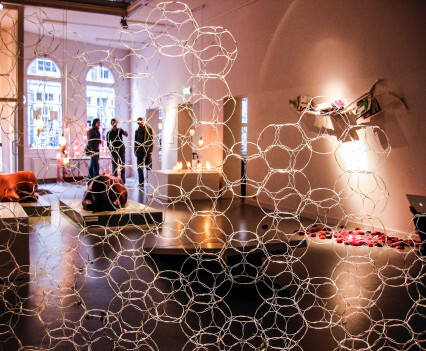 With our installation we want to offer a tool that allows people to experience changes in our weather and to rethink their relationship with a very fragile and highly interconnected atmosphere that secures life on this planet. All natural growth patterns are based on the golden ratio, which can be expressed in a large number of ways – from the Fibonacci sequence to the spiral patterns of sunflowers and pinecones. In our design for Weather Patterns we have reworked the classic dot-matrix display, creating a spiral-based matrix capable of reproducing basic movement, rotation and growth patterns without the pixilated aesthetic of most low resolution displays. 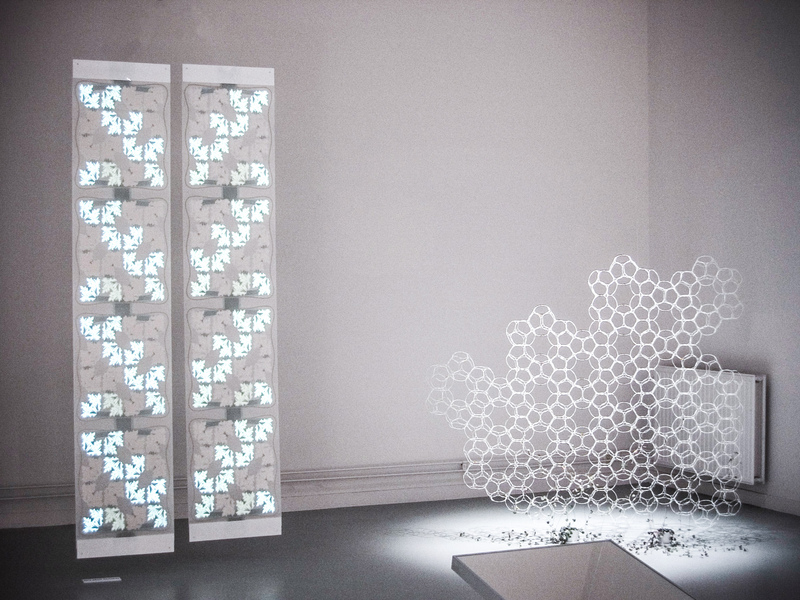 Similar to how one learns to read the face of a clock, the animated pattern language we developed for the installation can be learnt by living with the installation on a daily basis. 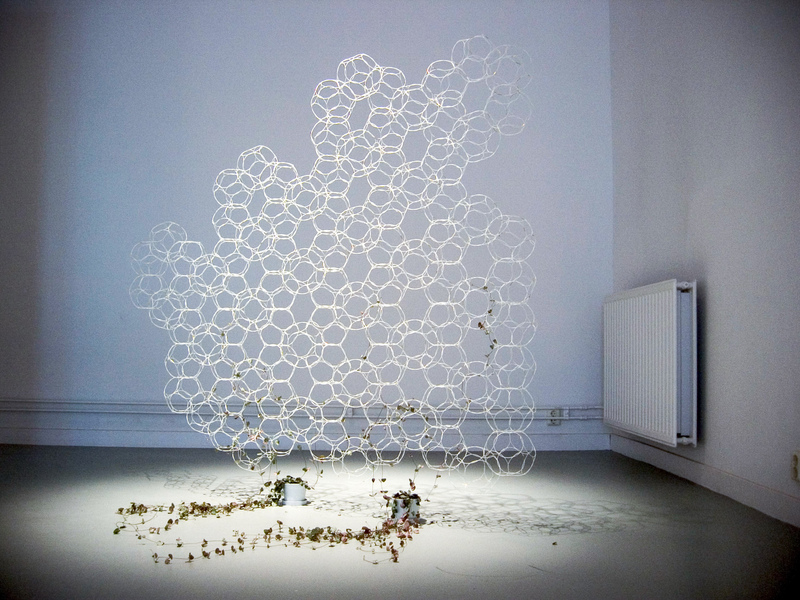 Blumen explores the experience of human presence and action having a tangible effect on space and provides a direct and analogue reflection of this by addressing the point where ambient space ends and surface begins. A new depth and language is brought to otherwise dormant decorative materials that simply surface and contain space. Blumen transforms traditional decorative surfaces into a rich, dynamic display of botanical life. It divides and ornaments space and can be seen in a wallpaper format as sliding panels. By working with traditional pattern-making we have created an ornate printed design, which functions at the same time as a working electrical circuit using electroluminescent technology. The repeating pattern allows the piece to be cut into smaller sections and even reassembled. 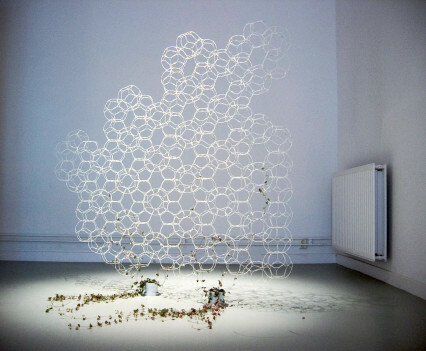 The Blumen print is constructed from a number of addressable cells. Sensing various external stimuli, the pattern emerges and develops in response to its environment. 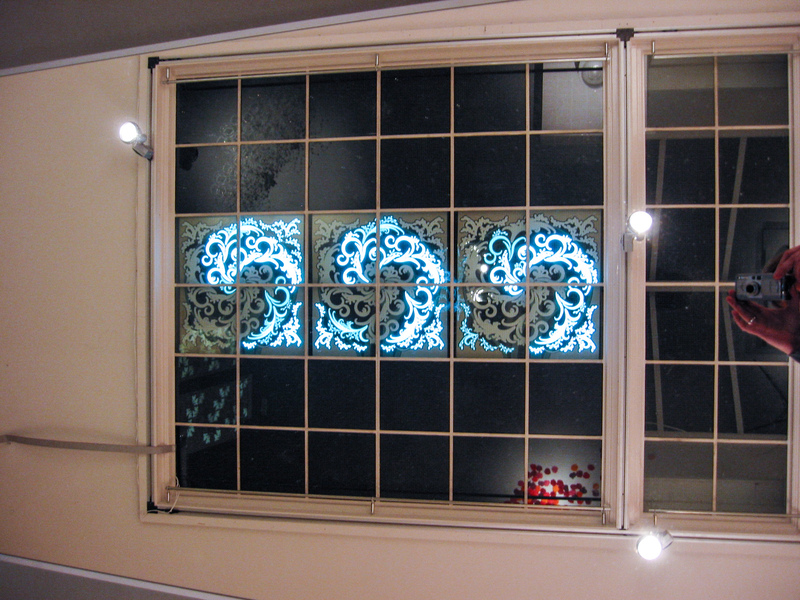 Depending on the space the panels are presented in and the characteristics of the sensors used, we develop an animated pattern language described in software. Patterns in the sound environment are transformed into visual patterns on the wallpaper. 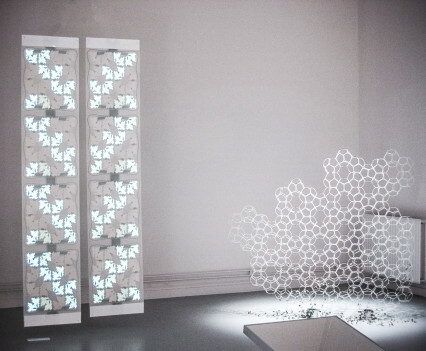 Biowall is a hand woven three-dimensional structure that can be crafted into lace-like walls of any dimension. 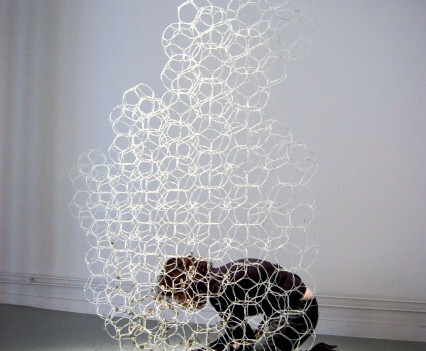 Springy fiberglass rods are bowed into rings and woven into several dodecahedra that in turn are joined together. The woven fibres create a balance between the rigidity of sheet material and the flexibility of a textile. 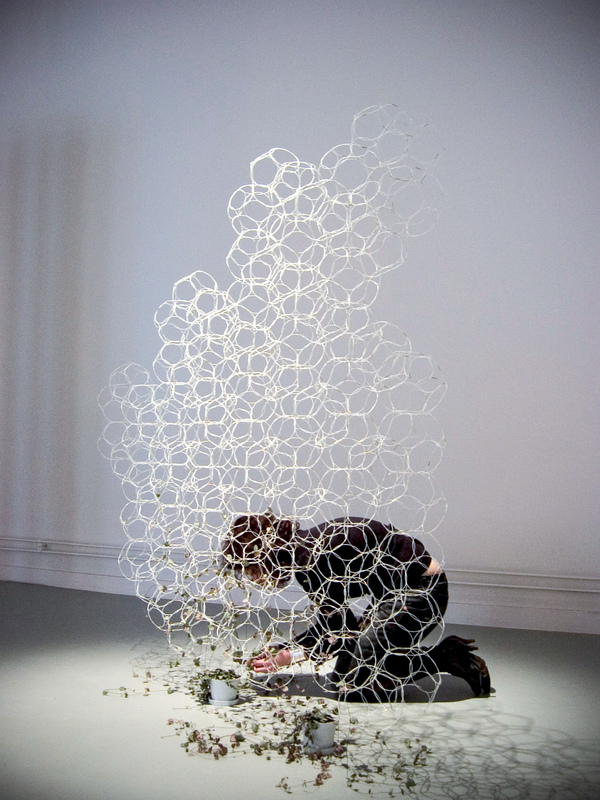 The structure is based on the principle of self-similarity, enabling it to work from the nano to the macro scale. It can be seen in our natural environment in the formation of bubbles, living cells and water molecules. 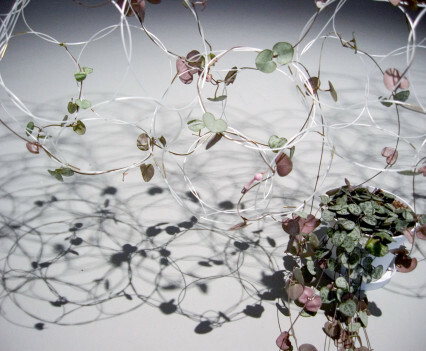 With plants creeping and crawling around the structure, BioWall can become an indoor, living hedge. By observing the behaviour of plants many farmers can predict and understand changing weather patterns. It becomes increasingly difficult to read the signs of our natural environment in urban, built landscapes. We use plants in our work as we consider them to be the most sophisticated sensors and displays. We often use technology to try to reintroduce these ideas by creating reactive surfaces inspired by botanical life that reflect and communicate environmental changes. Share the post "Droog Design: New British Design"